India and European Union in the field of Water Resources. 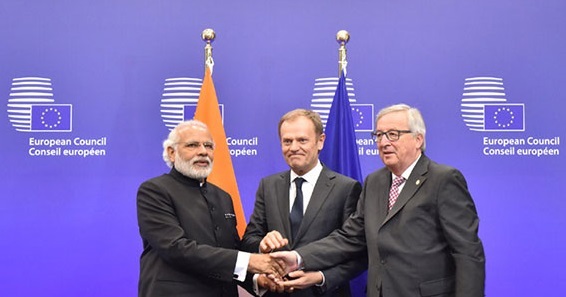 The Union Cabinet under the Chairmanship of Prime Minister Shri Narendra Modi has given its approval for the signing of MoU between India and European Union in the field of water resources. The MoU envisages strengthening the technological, scientific and management capabilities of India and the European Union in the field of water management on the basis of equality, reciprocity and mutual benefit. It provides technical exchange on water issues, including on integrated water resource management plans within river basins and through study visits. The MoU aims to identify key environmental issues and approaches to sustainable development where exchange of experiences and cooperation could be mutually beneficial to strengthen and further develop cooperation between India and the European Union in the field of water management. It envisions a more sustainable management of water resources in India with an objective of tackling the challenges posed by water management in the context of growing population, competing water demands and a changing climate. A Joint Working Group shall be formed to monitor the activities to be carried out in fulfillment of the MoU. The Ministry of Water Resources, River Development and Ganga Rejuvenation has been envisaging bilateral cooperation with other countries in water resources development and management through sharing of policy and technical expertise, conducting of training courses, workshops, scientific and technical symposia, exchange of experts and study tours. Keeping in view the success of the European Union in distribution of water resources, water pricing, water use efficiency by encouraging the changes in agricultural practices necessary to protect water resources and quality, such as switching to less water-demanding crops, etc., it has been decided to have an agreement with Israel to benefit from their experience and expertise. The EU States have adopted water pricing policies to provide adequate incentives for users to use water resources efficiently thereby contributing to environmental objectives.